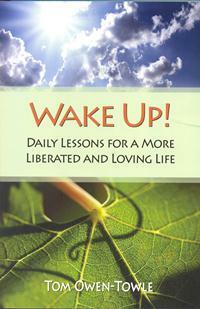 inSpirit: UUA Bookstore and Gift Shop: Wake Up! Wake Up! is for anyone who wishes to experience greater illumination and clarity in his or her own life. It aspires to make us smile, open a few stuck doors, rouse us from a moral slumber, and make our days and nights more bearable and beautiful by waking us up to a state of conscious, deep awareness. In short, these are proven lessons designed to help nourish a sense of spiritual wakefulness, in each day and in every moment. More importantly, these are not the familiar principles and perspectives that we've often seen before. They are unconventional-even quirky and edgy-pointers that awaken us to live a more balanced and well-integrated life.